Giovanni Fattori (Livorno 1825-Florence 1908), one of the major figures of the Macchiaioli, and one of the most important painters of the nineteenth century in Italy, began etching in the early 1880s, when he was nearly sixty. We do not know who taught Fattori to etch or when he started to make prints, but it is generally assumed that he was encouraged to take up etching seriously, when, in 1883, he received the commission from the council of the Promotrice Fiorentina to engrave his 1862 battle picture, The Cavalry Charge at the Battle of Montebello. Fattori made some 200 etchings and, though often their dating is very uncertain, certainly he worked as an etcher until the end of his career. A real peintre-graveur, he continued with etching his artistic research on light and essential shapes in reality. 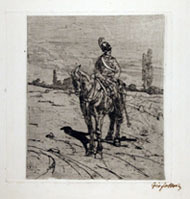 A portfolio of Fattori's lithographs, '20 ricordi del vero, was published in 1884, but he seems to have abandoned lithography after the mid 1880s. In this page I present some significant examples of prints by Fattori passed through my hands in the past, along with new pieces that I offer for sale.